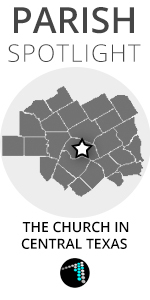 This is another installment in the series called Parish Spotlight, which is dedicated to featuring the different parishes in the Austin Diocese. Today we will be featuring St. Peter Catholic Student Center at Baylor University in Waco, Texas. St. Peter’s Catholic Student Center is where I found myself during the four and-a-half years I studied at Baylor. While I am no longer a student, I find myself stopping by for Saturday Mass in the mornings before football games and occasional chats with Fr. Daniel and other members of center staff. The first group of Catholic students to become a chartered organization at Baylor University in Waco, TX was the Newman Club in the early 1950’s. At that time, and until about 1992, the group met in an old house on 7th Street that the Diocese of Austin had purchased for the group. During the 1980’s the Diocese decided that the needs of the Baylor Catholic population would best be met by making the Newman Club into a ministry of St. Mary’s of the Assumption Church in Waco. Thus, the Catholic Student Association was officially born. Father Jim Chamberlain, Associate Pastor of St. Mary’s, became the group’s first director and celebrated their first Mass with them. In 1992, the Catholic Student Association moved into the Methodist Student Center on Speight Avenue near Baylor’s campus, with Father Frank Miller as the regular celebrant of the Mass. With the establishment of the Marist Fathers community in Waco in 1998, Fathers Kevin Duggan and John Ulrich became regular celebrants for the group. In 1999, the Diocese of Austin built the students a new facility. The Catholic Student Center (current location on 9th Street) was dedicated by Bishop John McCarthy on October 10, 1999, and is currently the home of the Baylor Catholics. The center was later renamed St. Peter’s Catholic Student Center at Baylor University. For the next thirteen years, many priests have served as full-time chaplain of the center including Father Jim Deaconson, Father Karel Fink, and Father Anthony Odiong. In 2008, the Catholic Student Association became the first non-Baptist, religious student organization at Baylor University – the world’s largest Baptist University. In 2012, Father Daniel Liu became St. Peter’s Catholic Student Center’s second full-time chaplain and the Baylor University became a FOCUS campus. As of the Fall 2015 semester, the normal daily Mass attendance is near 50 students and the aggregate weekend Mass attendance is near 600. In 2014, St. Peter’s began offering the traditional Latin Mass and is one of three locations in the Diocese of Austin where it is offered regularly. Mass times: Sundays at 9:30 am, 11:30 am, 9:00 pm. (10:30 am during summer months), Weekday Masses at 5:30 pm. Confession times: Wednesday and Thursday, 4:30-5:30 pm. Visit the student center here on Facebook.